Murder by Gaslight: The Corn Field Murder. Sarah Alexander, a seventeen-year-old Jewish immigrant from Poland, left her home on the Lower East Side of Manhattan on December 12, 1875, to look for a job. She never returned. When she was still missing the following day her family placed an announcement in the New York Sun asking or information on their missing girl. Her uncle, Israel Rubenstein, noticed in the same edition of the Sun, a description of a murdered girl found in Brooklyn exactly matching that of Sarah Alexander. He later identified the body as his niece Sarah, but he never dreamed that her killer was his own son Pesach. When the body of a young girl was found brutally stabbed and slashed in a cornfield in the East New York section of Brooklyn, local residents feared that she was one of their own and more than a thousand people went to the police station to view the body. When no one could identify her the police concluded that the girl had come from Manhattan and began questioning street car conductors and ferryboat crewmen hoping someone would remember bringing her to Brooklyn. The girl had been savagely attacked. A deep wound on the right side of the face extended from the lobe of the right ear to a point directly at the center of the throat. Another gash on the right side of the face extended from the cheek bone down to the angle of the mouth. On the left side her ear had been sliced in two and the throat cut, severing the carotid artery. A deep wound in the throat looked as if the knife had been turned after being plunged in. She had mud on her knees and defensive wounds on her hands suggesting that she had been begging for her life when she died. The murder must have been committed prior to the snowstorm on Monday, December 13, as the wounds were filled with snow when she was found. She was a small woman, not more than five feet tall. Her face was round, with dark eyes and straight dark brown or black hair; her complexion was dark. She was clean and well dressed and wore a pair of gold earrings with garnet settings. In a stack of corn the police found the murder weapon; a small knife, encrusted with blood, with a three and a half inch blade crudely riveted into a black walnut handle. It was recognized as a cigar maker’s knife. This, together with the woman’s dark complexion led the police to believe that she and her killer may have been Cuban. Harry Lee, a conductor on the Broadway and East New York streetcar line remembered taking a “short, swarthy young woman” to the Seventh Street Ferry on Sunday night. She was distinctive because she wore no hat or bonnet and had a single braid of hair down her back. Several streetcar passengers on the Brooklyn side also remembered a hatless woman with a dark complexion. She was accompanied by “a swarthy Polish Jew, of forbidding mein” who seemed somewhat nervous. When they got off the streetcar they went in the direction of the Jamaica plank road, not far from the cornfield where the body was found. Back in Manhattan, John Alexander was worried about the disappearance of his sister Sarah. She had left their house on Bayard Street on Sunday, December 12 to look for a job, and had not returned. On Monday he went to the home of their uncle, Israel Rubenstein to see if anyone there had seen her. They said she had stopped by on Sunday but left in the afternoon. John Alexander worked as a peddler, and when he could afford it, he brought his sister Sarah to New York from their home in Poland. Sarah was described as a very industrious and religious girl who knew no one in New York outside of her family. When she first came to America she took a job as housekeeper for her uncle, Israel Rubenstein, but she had recently decided to find a job as a seamstress. The family feared that Sarah had been kidnapped and forced to work in one of the brothels in their neighborhood, and when they reported her missing, the police had the same idea. John also placed a notice in the New York Sun seeking information on the missing girl. When the paper came out, Israel Rubenstein noticed that on the same page as the notice was the description of the murdered girl found in the East New York cornfield. He knew immediately it was Sarah and hurried to the police department. 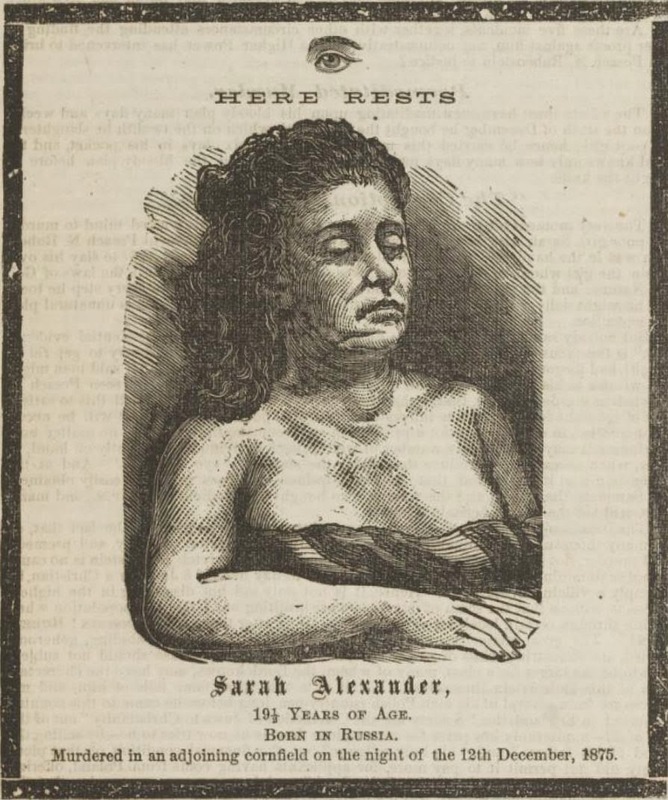 The body was brought to Manhattan from the morgue in East New York and the family members positively identified her as Sarah Alexander. Mr. Rubenstein told the police about an interesting dream his son Pesach had on Sunday night. Pesach told his father that in his dream Sarah had been taken by an Italian to a cornfield ten miles away from New York City. She told Pesach to bury her. The father marveled at how prophetic the dream had been but the police saw it with a more jaundiced eye. They immediately brought Pesach in for questioning. 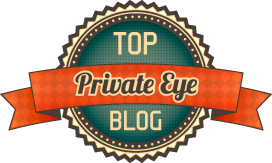 Twenty-eight-year-old Pesach Rubenstein had been in America for two years and was planning for the arrival of his wife and child from Poland. He was a successful jeweler and a devoutly religious man who went to shul every day. Pesach was also somewhat sickly, plagued by consumption and kidney disease. Sarah had nursed him back to health when she was working in the household and the two became quite close. The distinctive earrings that were found on the body were made by Pesach. Circumstantial evidence began to accumulate against Preach Rubenstein. His boots were a perfect match or foot prints found at the murder scene. 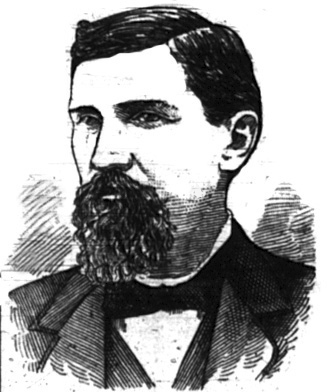 The knife was traced to the cutlery shop of Gustave Simon on Division Street. Thirteen-year-old Augusta Simon distinctly remembered the transaction because the buyer paid full price for an unfinished knife. The police arrested Rubenstein; they were convinced that he was the killer though they did not yet have a motive. That problem was solved when a thorough post-mortem examination of Sarah’s body showed that she was five months pregnant. The accusation of murder against Pesach Rubenstein divided the usually tight-knit Jewish community of the Lower East Side. The Rubensteins decried the fact that there were no Jews on the jury that would pass judgment on Pesach and said the charges against him were driven by “thirst after the blood of the Jew.” But Sarah Alexander had also been Jewish and most in the community sided against Rubenstein and were appalled by his crime. The defense claimed that Pesach Rubenstein was too week from consumption to have committed such a violent murder. While in the courtroom, Rubenstein was provided with a personal spittoon in case he needed to cough up blood. Observers noted that Rubenstein did not cough once during the proceedings and never used the spittoon. The family claimed that Rubenstein was in the synagogue Emil Jacob when the murder was committed, but they could find no one who saw him there. Outside of court the Rubensteins were accused of trying to buy testimony of people who had seen or been with Pesach the day of the murder and to throw suspicion on Nathan Levy who had been seen frequently with Sarah Alexander. In the end, the circumstantial evidence against Rubenstein was too strong to ignore. The streetcar conductors and other witnesses who had seen him with Sarah Alexander, the knife merchants’ testimony, and the footprints in the mud convinced the jury that Pesach Rubenstein murdered his cousin to hide their illicit affair. After twelve days of testimony the case was given to the jury who deliberated for an hour and twenty minutes then returned a verdict of guilty. 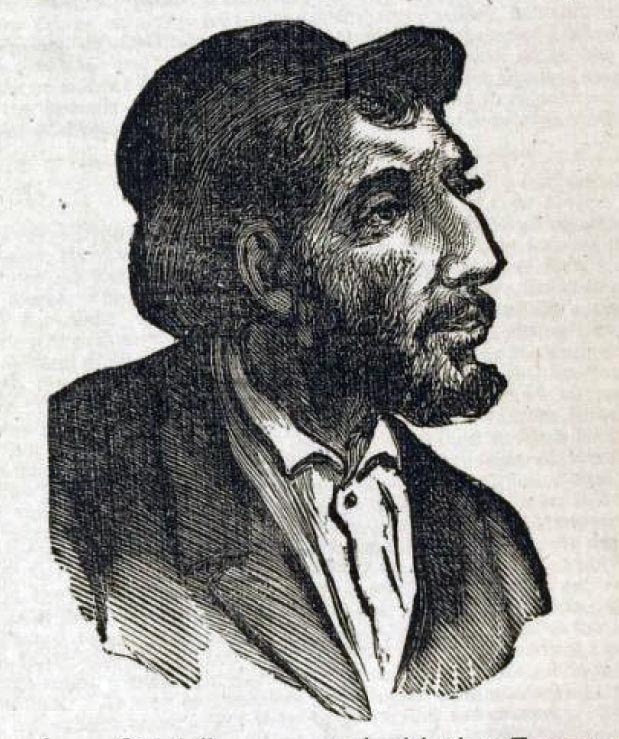 Pesach Rubenstein was sentenced to hang in March 24, 1876 and was taken to one of the “condemned cells” at the Raymond Street Jail in Brooklyn to await execution. He still vehemently denied his guilt and asserted that time would prove his innocence. He denounced Detective Zundt who had led the investigation and vowed that his family and friends would follow Zundt until his death is avenged. His jailers no longer allowed Rubenstein’s family to bring him kosher food, fearing they would try to cheat the gallows by poisoning him. They provided him with their own kosher dishes but Rubenstein ate very little, and spent most of his time in jail praying. His health began to deteriorate again. "Mysterious Murder of a Woman." Evening Post 15 Dec 1875. "A Monstrous Murder." New York Herald 15 Dec 1875. "Rubenstein the Murderer." New York Times 15 Feb 1876. "A Hebrew Girl Murdered." New York Sun 16 Dec 1875: 1. "The Murdered Jewess." New York Herald 18 Dec 1875. "The Murder of Sarah Alexander." Evening Post 9 May 1876. Guilt & Pleasure: WHO IS THE HEBREW GIRL MURDERER OF EAST NEW YORK? My ex-wife and I did some research on this matter back in 1976, for a Jewish Studies class she was taking at Brooklyn College. Comments made during the trial ("Those people" look out for their own...) would have resulted in a mistrial today, but Pesach Nissen Rubenstein remains the first Jew convicted of murder in the US. Sarah Alexander was buried in an old and overgrown cemetery in East New York, on the Queens border, and conveniently near the school where I was teaching at the time, and on Dec. 12, 1976 I wandered through it. The stones were tumbled down and the records long since gone, but when I felt I was in the right spot I said an El Molay Rachamim and a kaddish for her soul. Rubenstein's case was slated for review by New York's Court of Appeals when he died, so the case was rendered moot and never reviewed. This means that technically he died in a state of limbo between guilty and innocent.